I was a little busy yesterday so I neglected to get on my soapbox for the Monday Morning Pet Peeve, so here it is, on Tuesday. This weeks Pet Peeve is an ode to my neighborhood. I live off of a very busy artery into the city in an ever-more gentrifying part of the city. But my biggest pet peeve is not the influx of well-to-do 30-somethings who think its cool to live in a developing neighborhood and be walking distance to their "local" hipster bar. No! 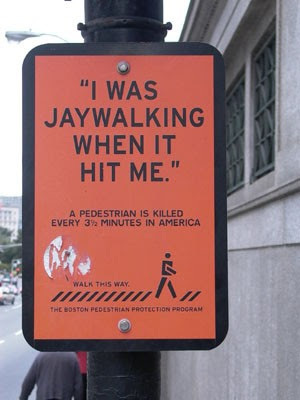 My pet peeve is jaywalking! Yes, I know it may sound insignificant and petty, but when It takes me 20 minutes to make a 4 minute trip to the store because people on every street feel the need to hurl themselves into traffic, it boils my blood! Recently I've noticed pedestrians on the major avenue near my home actually wait till they DO NOT have the right of way, to cross the street. I was completely perplexed the first time I saw it. A young lady and her child (Yes! She had a child with her) were waiting at the corner. I was waiting at the light. I was confused as to why she wasn't crossing the road. As soon as my light turns green, she decides to step in front of my car and cross, with child! Then, proceeded to give me a mean mug as she crossed the street, like I did something wrong? I understand most traffic laws (if not all of them) protect the pedestrian, but maybe with the a new president we can adopt new laws against stupidity and lack of common sense!